Note: This mug shot is from an arrest in Adams County Sheriff&#39;s Office from 2018. 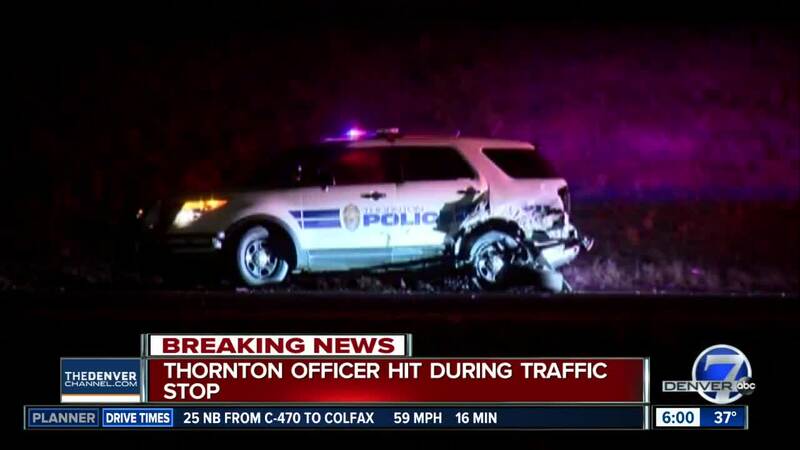 THORNTON, Colo. — A Thornton police officer was injured after his vehicle was struck by a suspected DUI driver while he was conducting a traffic stop on the off-ramp from northbound Interstate 25 to 104th Avenue early Monday morning. The officer pulled over a vehicle around 4:12 a.m. according to officer Matt Barnes, spokesperson for the Thornton Police Department. At 4:26 a.m., he called for help, saying he had been struck by another vehicle. "The officer was transported to a local hospital with non-life-threatening injuries," police tweeted. Matt Barnes with the Thornton Police Department said the driver who hit the officer's car was arrested on suspicion of DUI. She has been identified as Brittany Noll, 29. The Colorado State Patrol is investigating. The off-ramp reopened at 5:40 a.m.